Are you looking for the best rates on Lexmark toners? If your Lexmark printer is running out of laser toner you could receive significant cost savings by obtaining all your replacement Lexmark T420 toner with Cartridge Save. Cartridge Save maintains a lower price policy to ensure that you receive very good offers on any Lexmark T420 toner cartridges without the need to to go and shop on overpriced electronics stores Furthermore, we only ever supply Lexmark T420 toner cartridges that are both cheap and well-made so then you'll get security with each and every order placed. Get Lower Prices Today On Lexmark T420 Toner! Here at Cartridge Save you will get free overnight delivery for Lexmark toners. Start to save right now when you get value Lexmark T420 toner cartridges by using our online shop. Meanwhile, you can purchase this cheap Lexmark T420 toner by just telephoning our orders line directly when the time suits. Customer satisfaction is our primary priority and so we provide you with a no-hassles money back guarantee on all Lexmark T420 toner cartridges to ensure that you receive 100% customer satisfaction. To find the ultimate bargain on Lexmark T420 printer cartridges you can't get better than ordering from Cartridge Save. 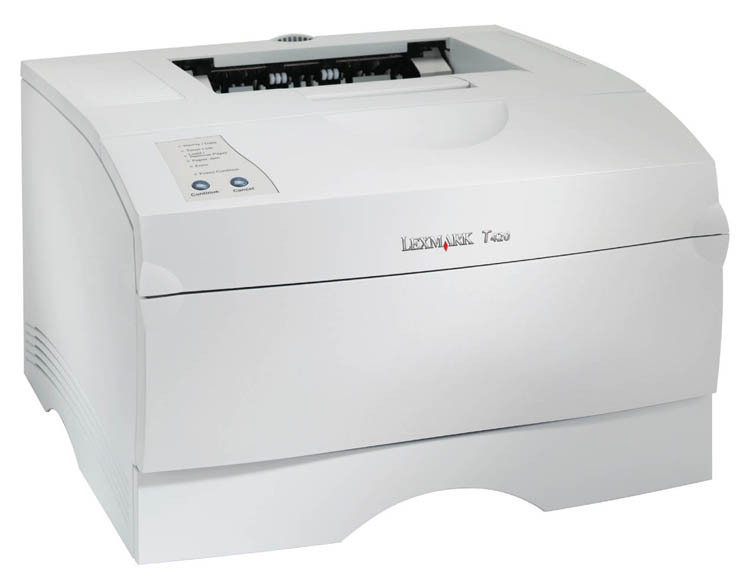 Small offices with high-volume printing needs may opt for the Lexmark T420 printer. This monochrome laser printer has a maximum resolution of 600 x 600 dpi for texts and 1,200 dpi image quality. The Lexmark T420 monochrome laser printer can deliver 50,000 pages per month and it offers crisp and professional output. Networking connectivity is not standard to the device. The compact Lexmark T420 laser printer comes with a small control panel and offers parallel and USB interfaces for connectivity. This model measures 424 x 406 x 259 mm and weighs 13.7 kg. It has a standard paper handling capacity of 350 sheets but it can be expanded to 850 sheets. The Lexmark T-420 mono laser printer has a print speed of 22 ppm on simplex mode with the optional duplexer it has a speed of 12 ppm. This monochrome laser printer is very easy to use and operate. Offices will have no trouble storing or placing it on desks as it has a small footprint. The Lexmark T420 black and white printer is offered at a reasonable price and running costs are affordable, too. The T420 printer is very reliable and it can help save time as it has high paper handling capacity. For savings on toner, Lexmark manufacture high capacity cartridges for the Lexmark T420. Cheap compatible Lexmark T420 cartridges made with recycled parts will also work in this machine. Since this device is the basic model, it does not come with networking connectivity nor automatic duplexer. The Lexmark T420 is ideal for small offices but it will not be sufficient for more demanding environments. Print speed could be faster and the T420 lacks a display on its control panel. A USB host would also be handy to allow direct printing from thumb drives.